However, planning a successful housewarming party does take a little bit of thought. 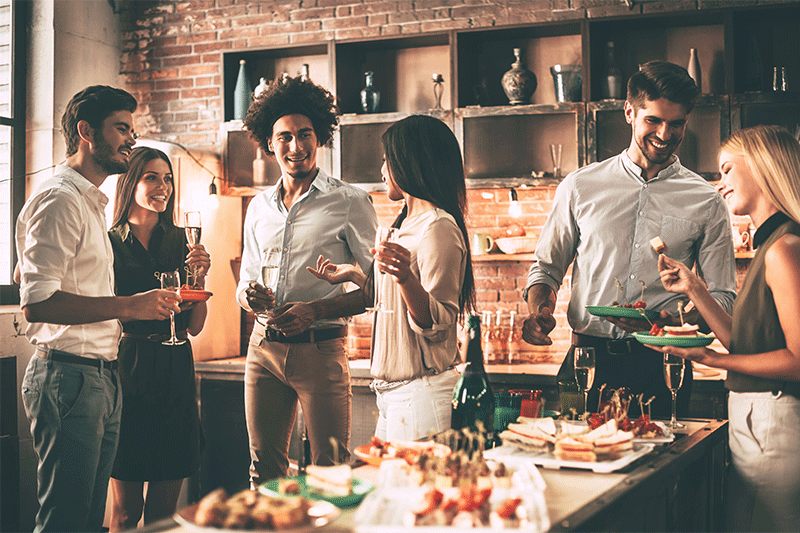 So to help you out, we’ve come up with our top ideas for hosting a party that will be remembered for all the right reasons. Don’t host it straight away. Okay, so you’re probably raring to show off every angle of your new home, so don’t spoil it by hosting your party too early. Unopened boxes and clutter can really get in the way of a good night, so make sure you give yourself plenty of time to get settled before you plan your party. Okay, so it might be a bit awkward to pop by your neighbour’s house and invite them round to your housewarming, but that doesn’t mean you shouldn’t at least warn them about your plans first. Especially if you’re planning on having a big night, it will definitely help to maintain friendly neighbourly relations if you give them a heads-up before the event. A simple handwritten note in their letterbox can even suffice. If you’re planning a themed party, make sure to give your guests plenty of time to get their costumes or outfits together beforehand. Themed parties can be great when it comes to organising food and drinks, and will also make choosing decorations a lot easier. However, this type of party does require more time and thought to pull off, so if you’re not feeling up to the challenge, probably leave it for now. Your guests will have a good time either way! Decide on a time for your event and stick to it. You don’t want to still be rushing around getting ready when your guests arrive, so make sure you get all the shopping and decorating out of the way as quickly as possible. Make sure you stagger the food throughout the evening, and try and have snacks on hand for those who like to graze. Make sure you have plenty of cups, ice, plates, napkins and cutlery on hand to last you through the night, too. Make Spotify your friend and create an awesome playlist before the night. You can always start with some easy listening music and then graduate towards those must-have dance floor songs as things start to get merry. Make sure you have plenty of space to create a dance floor, as no doubt your guests will make good use of it as the night goes on. So, there you have it! We hope these 5 tips will help you create a truly awesome housewarming party. Don’t forget to have your camera or phone on hand to take some snapshots of the evening, and, above all, make sure you relax and enjoy yourself. After all, you’ve earned it! If you’re not yet ready for the housewarming party, and are still looking for a new home, Ventura Homes can help. Browse our range of stylish and innovative floor-plans – including designs for narrow lots – at our website.